At E's last checkup, our doctor mentioned that we could start giving him purees if he seemed interested. We'll hold off on any real food until 6 months, but it's okay to start slowly introducing stuff to him now. Since E just learned what pumpkins were, we thought we'd let him taste them too. We weren't sure he'd be interested in food yet, but decided we'd give him the option. We put a little bit on the tray of his highchair and some on a spoon which we handed him. 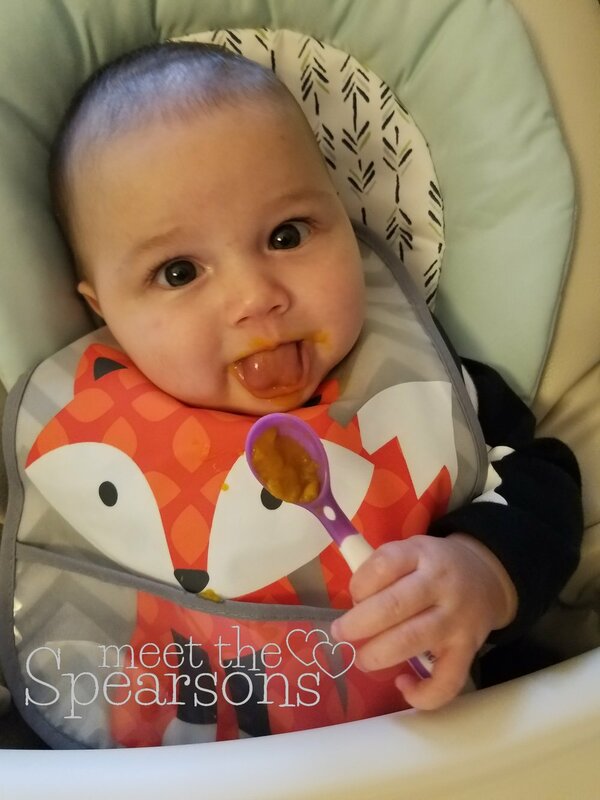 He tried a bit.. and at first was excited about the spoon we gave him, but then decided he didn't like what was on it. We got some fun faces, but once the tears started we decided he was done. I doubt food will become a regular occurrence for him, but it was a fun start.